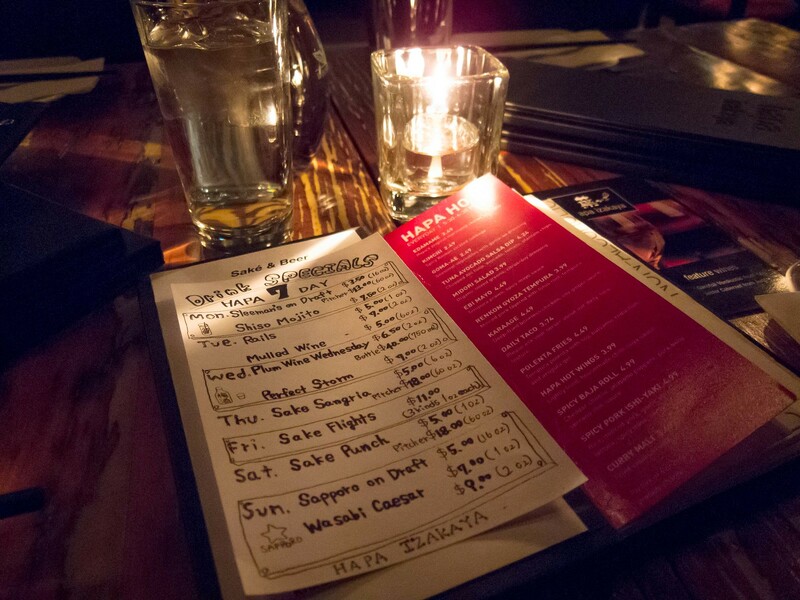 One of the many restaurants that have been long sitting on my Urbanspoon wishlist is Hapa Izakaya. 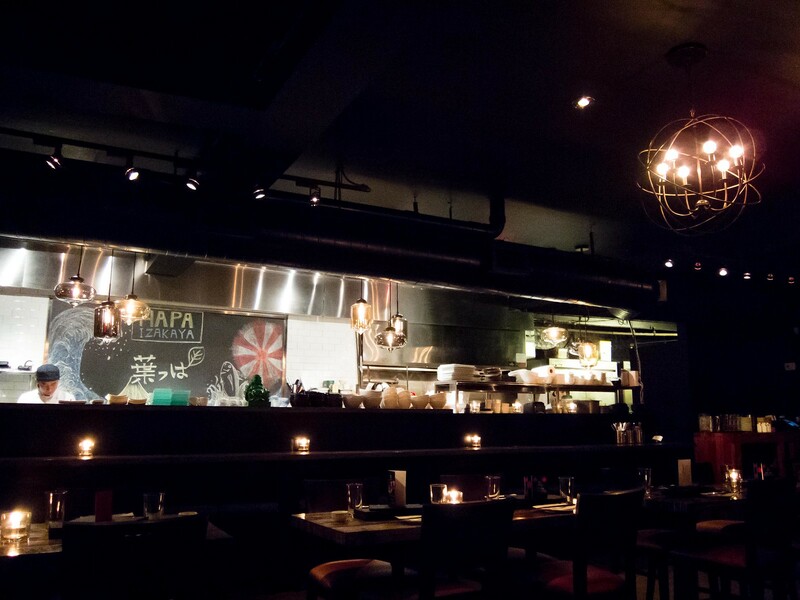 An import from the west coast, Hapa opened their Little Italy location in September 2012. Unfortunately, they suffered extensive damage during the flood in July and had to close for a few months for repairs. 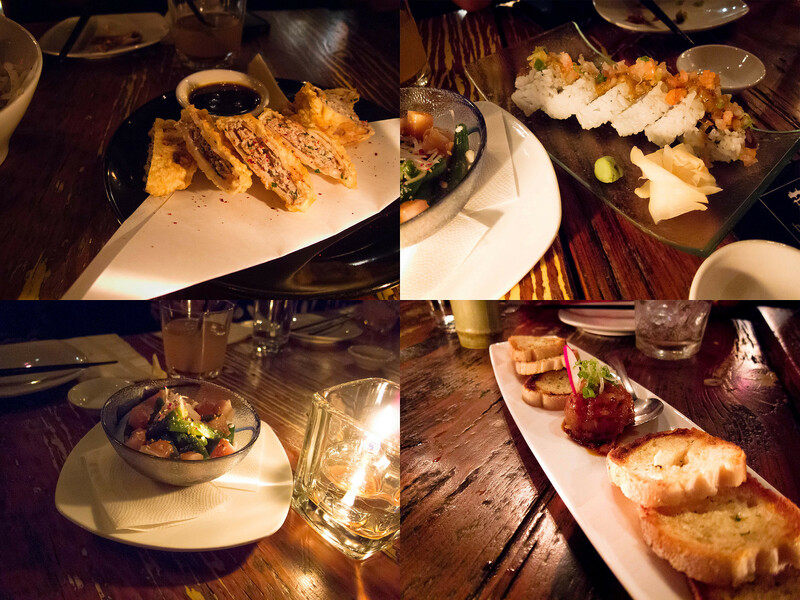 When a friend was back in town from Malaysia recently, Hapa was the perfect venue to host our bigger group with good food and drinks. 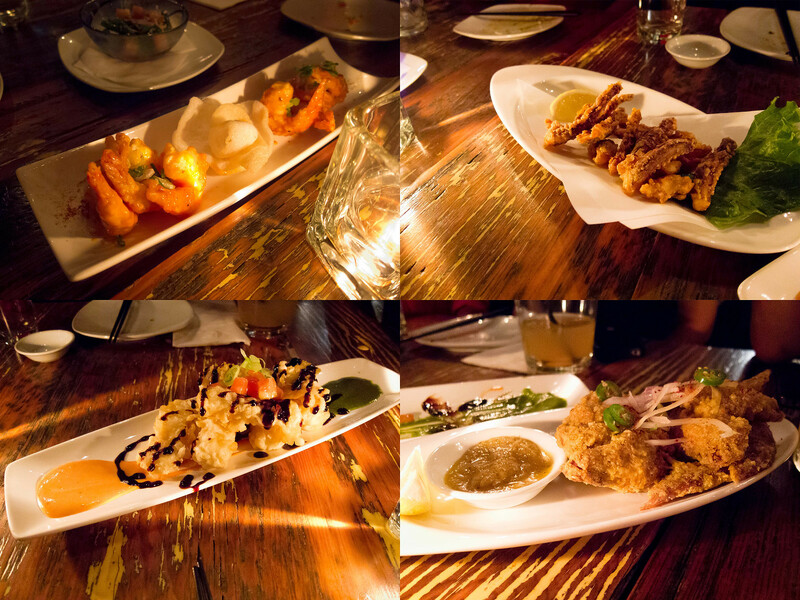 Atmosphere: The intimate lighting and prominent bar gives Hapa a cozy and boozy feel. 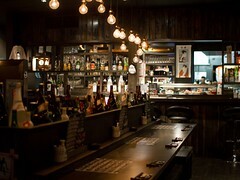 Dark wood tables and leather covered chairs add to the interior’s bar vibe, fitting for an izakaya. There are lots of tables for large groups. In fact the night we were there, tables were joined to seat at least 30 people together. With music playing and sake arriving in bamboo pitchers, Hapa makes you want to order another drink, or two, and I hear there’s dancing at special events. Service: Our server was all smiles and very friendly. She also checked in on us before Hapa Hour ended to see if we wanted to add dishes, which I really appreciated. Every dish arrived quickly and it was easy to get someone’s attention when we needed to. 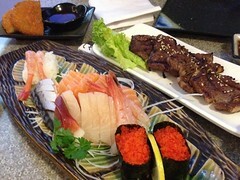 Food: As always when I go to an izakaya with a large group, we ordered 90% of the menu. I made sure we were in time to take advantage of Hapa Hour (<$5 plates everyday from 5:30pm to 7:00pm) and seriously, it’s such a great deal. We ordered one portion of each dish to start and then doubled up on favourites. 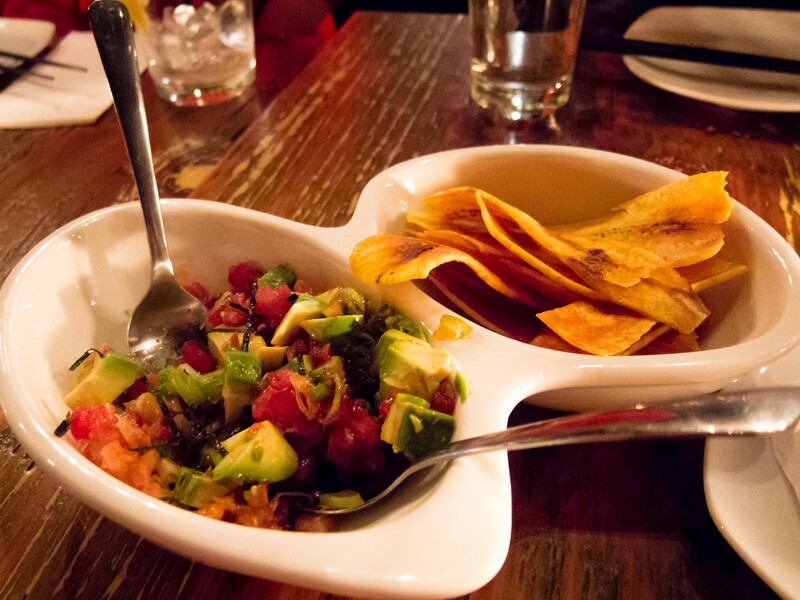 From the Hapa Hour specials, the standouts were the Karaage and Tuna Avocado salsa dip. I loved the plantain chips that were served with the dip and the karaage was one of the best I’ve had in the city, light crispy batter and juicy tender inside. Next was the Ebi Mayo, Curry Calamari, Polenta Fries and Hot Wings. I could pass on the polenta fries, the texture of the polenta wasn’t stiff enough and the tempura batter didn’t help hold the fry together either. I liked the batter on the hot wings and they weren’t overly spicy. We did get a second order of the curry calamari. 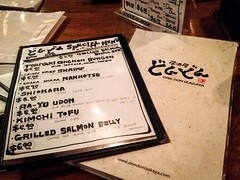 We also ordered the Renkon Gyoza Tempura, Spicy Baja Roll, Goma-ae and Negitoro (non Hapa Hour). From these four, I liked the Renkon Gyoza, which was more of a friend pancake, and Negitoro best. 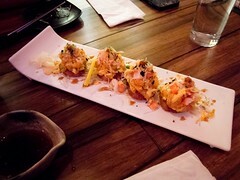 The Spicy Baja roll and Goma-ae were good but not stand outs. 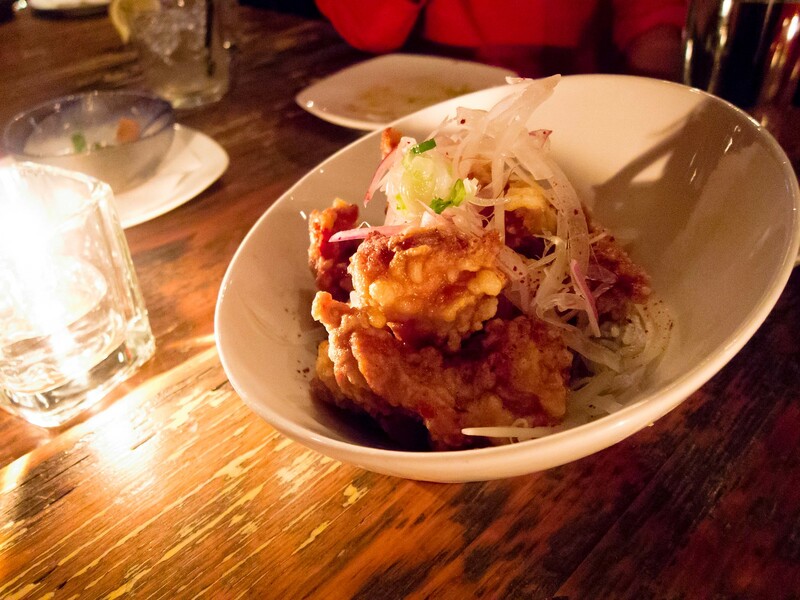 Our last item from Hapa Hour was the Spicy Pork Ishi-Yaki, a rice dish served in a hot stone bowl. The rice formed a nice burnt crust on the sides of the bowl and was well flavoured with the spicy mayo and chives. 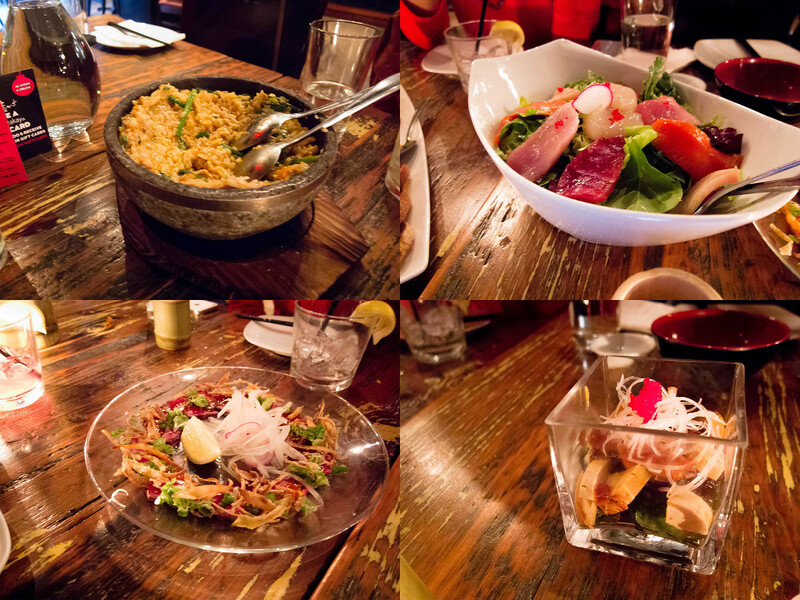 From the regular menu, we ordered the Sashimi Salad for some greens, Beef Tataki and the Monkfish Liver. The salad and monkfish liver were only ok and I would trade other menu items in favour of them next time while the Beef Tataki was pretty standard. 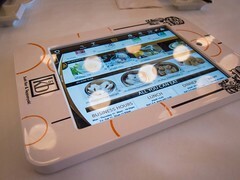 we’re planning to check out this place within the month, can’t wait to try out some of your suggestions! by the way, we love your blog! thank you! hope you guys enjoy, their hapahour is such a good deal!